It's May Day today, and it's the time of year that local band 123 Orion do their May Day gig for charity. 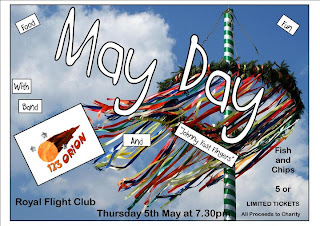 Once more this year they are playing at the fabulously priced Royal Flight club. RO 5.000 buys you entry to the gig, a portion of excellent fish and chips and the proceeds this year will be put towards relief efforts in Japan. If you are interested you can text Jon for tickets on 9935 3712. How is it that one day life is orderly and you are content, a little cynical perhaps but on the whole just so, and then without warning you find the solid floor is a trapdor and you are now in another place whose geography is uncertain and whose customs are strange?